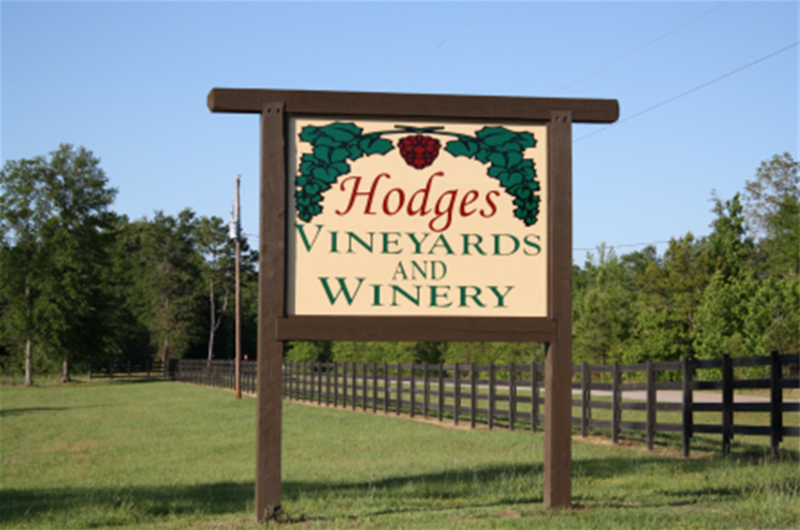 Hodges Vineyards and Winery is located in East Central Alabama just 4.5 miles off of Hwy 280 at mile marker 94. It is just a few minutes from Auburn, Auburn University, Opelika, and Lake Martin. The winery has a large selection of muscadine, grape, and fruit wines to sample and choose from. Wines are bottled in its on-site facility and much of the fruit is grown in its own vineyards. Most apples, blueberries, and blackberries are imported from within the state of Alabama to produce these fruit wines. Be sure to experience the taste of fine wines in East Central Alabama. Enjoy sampling all varieties in its elegant tasting room. Stroll through the vineyards and enjoy a bottle of wine under the pergola. Bring a picnic lunch to share with friends and see new plantings of Merlot, Lenoir, Norton, and Blanc du Bois grapes and Champanell vines.